Wood maintenance is often perceived as a mysterious and ancient art, performed by some kind of wood “shamans”. These “shamans” make scratches in wood finishes disappear, as if by magic. But it is not magic. There is no mystery to it. Wood maintenance involves finding those individuals with an artistic sense of color, equipping them with a pallette of wood -toned markers , fillers, and stains, and handing them a list of damaged wood to be touched-up. The real “art” of wood maintenance is doing the work without bothering anyone. It means scheduling and performing the work without any surprises-without angry tenants, without late-night calls from security, without bills for cleaning adjacent areas not properly protected. 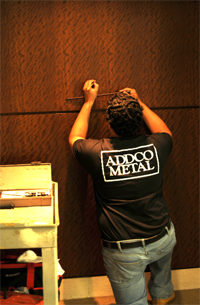 ADDCO METAL is well practiced at this art. For over thirty years, we have managed and performed metal, marble and wood maintenance services at the most prestigious addresses in the Southeast. Over that time, our goal has always been to make the work we do stress-free for our customers. 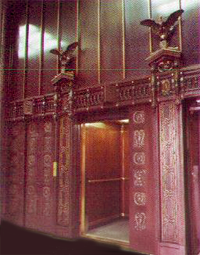 However, if the finer arts of wood refinishing are required, we have all those abilities too. From full refinishing or re-staining, to re-veneering and other major repairs, our technicians can handle any job, small and large.